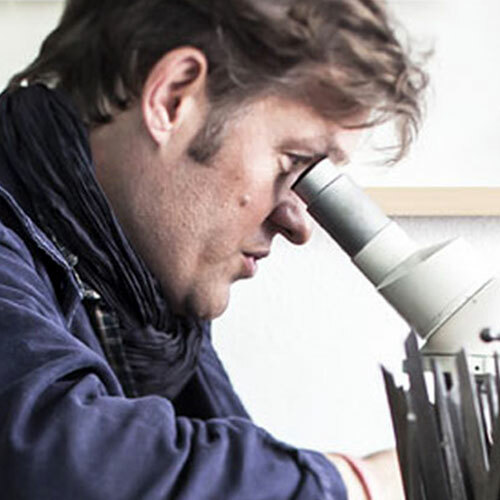 Engraver and medal maker, Nicolas Salagnac is awarded Meilleur Ouvrier de France (Best Craftsman in France) in 2000. Trained at the Ecole Boulle, in Paris, he obtained a degree of Fine Crafts in 1990. After 13 years working and learning the trade, he set up his own workshop, today in Villeurbanne. This traditional technique allows the craftsman to directly execute his work at the actual size and in the actual material, without using any machine. The engraver copies his drawing on the steel die, reverses it; then he follows closely his pattern, cuts into the material with his tools (gravers, onglettes hit with a hammer, chisels, sometimes ciselets) to create his model. He achieves his engraving on a punch (right side up) or a die (upside down) with the aim of batch striking his work. This technique requires a great proficiency, for an error is quite difficult to fix. This work also requires a talent for drawing, bas-relief carving and mastering of en modelé engraving. The model is first produced with plaster at scale 3:1, then downsized with a pantograph or a reducing lathe (machine developed for coins and medals since the 16th century). Finally, the engraver hand removes any trace of the mechanical treatment with chisels, gravers and ciselets. Probing of a bas-relief sculpture, laser machining, grinding with digital operations, engraving software for design development (à plat or en modelé). In order to convey the image of the project, I develop and draw a few mock-ups. Thus, the future medal is born under the pencil. 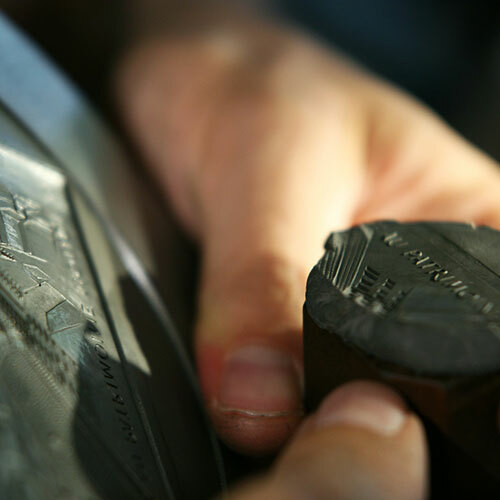 Once the designs of the obverse and reverse are set, the engraver starts the bas-relief sculptures of each design. This step towards the realization of the project involves modeling of the drawing, scale 3:1. Thus, the broad masses come to life and emerge from the plane. Then, from plaster prints to counter-prints, worked on and carved by hand, the design takes shape. The final shape is molded with a resin to serve as a template in order to be reproduced on a steel block. A steel block is positioned on a reducing lathe, on the left, and the resin print of the sculpture is set on the right. Now the machining begins. A touch probe inspects the entire surface of the sculpture and reproduce the shapes encountered in the piece of steel with a cutting tool. This step is long and accurate, we must outline at first and finish with the ‘finishing pass’ to engrave the details in steel. Finally, the engraver removes any trace of the mecanical treatment on the die. This step is achieved using gravers hit with a hammer, onglettes, chisels, ciselets, traçoirs, mats… He redraws and highlights the main lines of the designs. Thus, light, future key partner, will, by its passage, highlight the bas-reliefs, details and subtleties of the future medal. 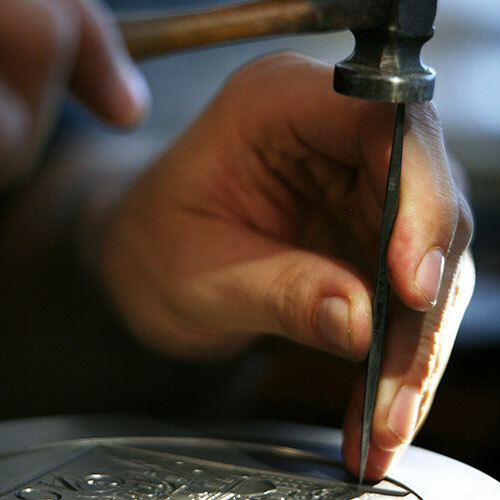 While hand finishing, the engraver now adds his « touch » and brings the future medal to life. Thus engraved, the dies are heat treated and become usable by the striker. The dies, placed on a 1600 ton press, will mark the bronze sides of the medals. Each medal is struck and then annealed in the oven, then struck again until all reliefs are obtained. After the stamping stage, they are machined according to their diameter. The patina finish puts the finishing touches to the medal and highlights the work of the artist. This operation has remained in the craft tradition as all the medals are reworked and hand finished. At the end of this long process, after carefully following all these steps, a medal is truly born. The place is flooded with daylight. The double workbench sits right in front of the bay window, to get as much light as possible. On this workbench, the tools of the hand-engraver: engraver and chiseller hammers, gravers (flat, « méplat », round), onglettes, ciselets, mats, brillants, traçoirs, perloirs, bouterolles, rifloirs, chisels… This tools are rare, for they are mostly handmade out of a steel bar. Some of Nicolas Salagnac’s tools have belonged to three generations of engravers. In 2004, Mr Claude Chaban, retired die engraver for cutlery, handed his tools to Nicolas Salagnac (« for them to live again through your hands »). Mr Chaban received these tools in the 1920s from another engraver, Mr Guttin. See below a film about the creation of a medal born out of a sculpture of Le Bernin, The Abduction of Proserpine by Pluto. One can’t avoid the noise of the machines, yet you will find a grinding machine, a pantograph, two reducing lathes (they may be old but they’re essential for the medal maker’s activity), a belt sander, a polishing reel; a workbench, with a vice; a hydraulic press and some small hard presses. These machines are Nicolas Salagnac’s main tools. They allow the engraver to copy the 3-times larger sculpted model on the steel die, by reducing it.